Finding a good mechanic is the best way to keep your car running well for years to come. How do you ensure you get the most for your maintenance and repair dollars? Simply consider these five things before taking your car in for service. What specific sounds, smells, sensations, and leaks have you noticed, and how often do they occur? What happened just before the car started acting up? 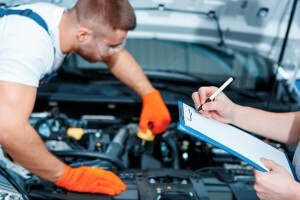 When was the last time you had your car serviced, and what work was done? Backfire: When a sound like a gunshot comes from the tailpipe or engine. Hesitation: The engine loses power briefly when accelerating. Misfire: When fuel in the engine’s cylinders fails to ignite and causes the car to hesitate. Bucking: When the engine hesitates, transmission slips, or vehicle lurches when changing gears. Bottoming out: When you hear excessive noise or feel harshness through the steering wheel while driving over bumps. Shimmy: A side-to-side movement of the steering wheel, especially at high speeds. Sluggish: The car fails to accelerate smoothly or powerfully enough. Surge: A sudden, unexplained increase in engine speed. Dieseling: When the engine continues to run momentarily after you turn off the car. Knocking or detonation: A rapid rattling sound while accelerating. When taking your car in for service, it’s smart to stick around until you receive a cost estimate for the work that needs to be done. You should prioritize the most urgent repairs if you can’t afford to do everything in one visit. It’s wise to call ahead and set up an appointment to ensure you don’t end up in line behind a lot of other cars. Ask how long your vehicle might need to be in the shop based on the service you require. If it’s longer than you want to spend waiting in the lobby, arrange for transportation back home. Scott’s Fort Collins Auto offers free loaner cars for qualifying repairs, so be sure to ask us about this complimentary service when setting your appointment! It’s common courtesy to declutter your car before taking it in for service. What’s more, tidying up the backseat and trunk can improve the service you receive. After all, if the mechanic must remove strollers, golf clubs, or other bulky items to access a certain part or perform a specific repair, it only slows down the work. Leave your daytime phone number with the repair shop and try to make yourself available so you can respond promptly. If the mechanic is unable to reach you, the repair can’t proceed, and your car will remain unattended in the shop. It’s also important to be available, so you know when the car is repaired and ready for pickup. If you stick around the shop because the work is expected to go quickly, don’t hover over the mechanic’s shoulder. It’s appropriate to spend time pointing out problems with your car when you first arrive, but once you’ve explained yourself, grab a cup of coffee and wait in the lobby so the mechanic can concentrate on the job at hand. With a history dating back to 1993, Scott’s has the experience you expect from a quality auto repair shop. Bring your car in for everything from a routine oil change or tune-up to brake repair or transmission service. We maintain and repair cars of various makes and models, both domestic and foreign. Give our Fort Collins auto shop a call today at (970) 682-4202 to schedule your next appointment!